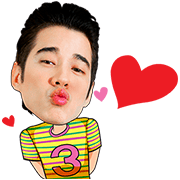 http://www.line-stickers.com/ – CH3 STARS Line Sticker | Celebrate 45 years of CH3 OFFICIAL with special stickers of our 16 celebrities. Friend CH3ʹs offical account to get these stickers for free! Available till April 1, 2015. Copyright : Copyright © BECi Corporation Ltd. Previous post Happy Womenʹs Day!